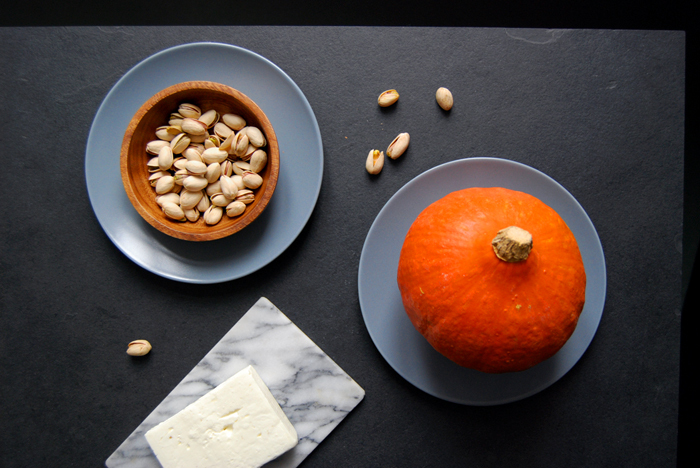 Oven roasted pumpkin has always been on the top of my list of winter favourites but I recently found out about a combination which makes this dish even more tempting: pumpkin, pistachios and feta cheese! The woman who introduced my taste buds to these culinary highs wrote a wonderful cook book called Persiana which I happily found under our Christmas tree. Sabrina Ghayour managed to come up with an amazing collection of beautiful recipes from the Middle East and beyond that caught my attention from the first page. Her family’s Iranian background combined with the fact that she grew up in England, let the self-taught chef create magical and manageable recipes praising her big culinary love, the Persian cuisine, by using ingredients that can easily be found at every supermarket. I find great relaxation and inspiration in this little gem, in the way she talks about food in general and about single aromas in particular. Although I didn’t have the time to cook many of her creations yet, I already read through the book three or four times. 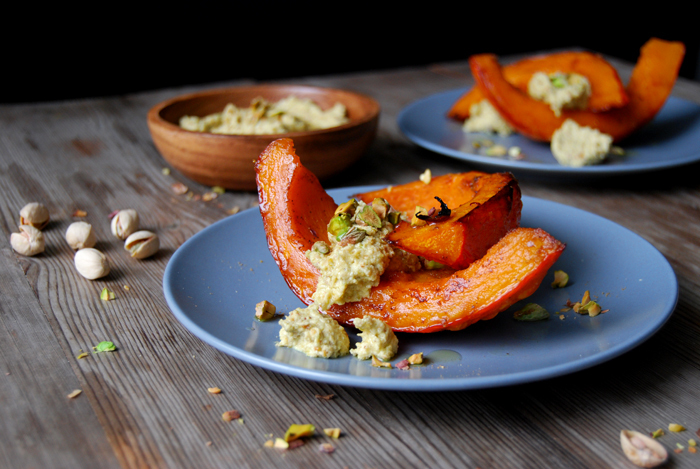 Her butternut squash with pistachio pesto, feta and pomegranate struck me every time I passed the page. I rarely follow cook books to the letter, I love to work with them and develop my own ideas, that’s what happened with Sabrina’s butternut dish. I roasted Hokkaido wedges the way I always do and added a little cumin to the olive oil which is very nice with the squash’s sweetness. 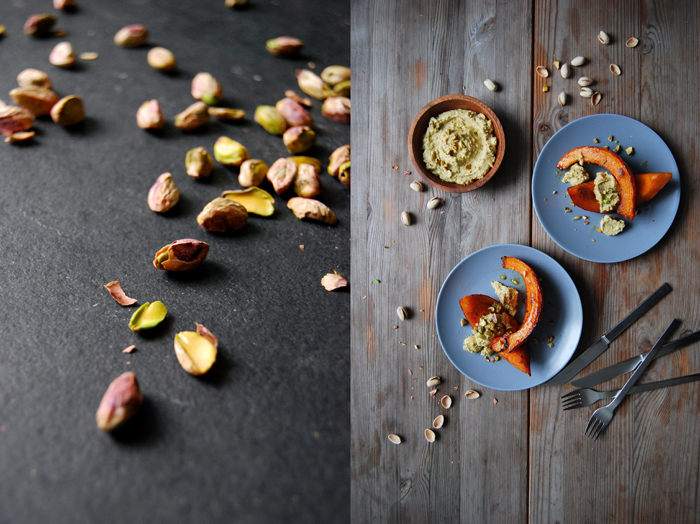 Her pesto didn’t make it into our dinner, but I whipped salty feta cheese with lots of pistachios, olive oil and cumin to a thick dip that I served on top of the warm squash. The combination of nutty, sweet and salty aromas is simply brilliant! Cut the pumpkin into large wedges, don’t peel it. Whisk 50ml (1 3/4 ounces) of olive oil with pepper and 1 teaspoon of cumin. Spread the pumpkin in a baking dish and coat with the spice oil. Sprinkle the wedges with salt and bake in the oven for 15 minutes. Turn the wedges and cook for another 7 minutes (Hokkaido) or 15 minutes (butternut) or until golden brown and soft. Grind 60g / 2 ounces of the peeled pistachios in a food processor and purée with the feta cheese, 3 tablespoons of olive oil and 1/4 teaspoon of cumin until smooth and well combined. Season to taste. 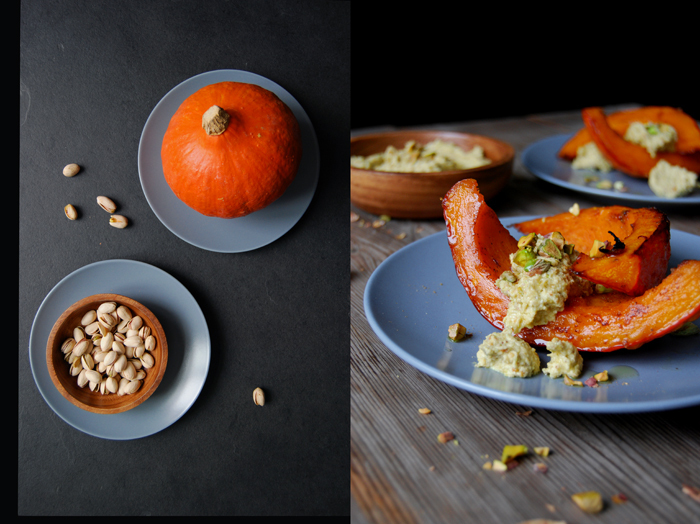 Arrange the warm pumpkin and the pistachio feta on plates. Peel and chop the remaining pistachios and sprinkle them over the cheese. If you like, add a little more cumin (to taste). If you choose Hokkaido, you can eat the skin, but if you went for butternut squash, you have to scrape it out of the skin (you can do that on your plate). Meike, I can’t get enough of roasted butternut squash in the winter. I also love feta, I will try this combination. Thanks for the book recommendation, it sounds wonderful. Persiana is such a wonderful cookbook. 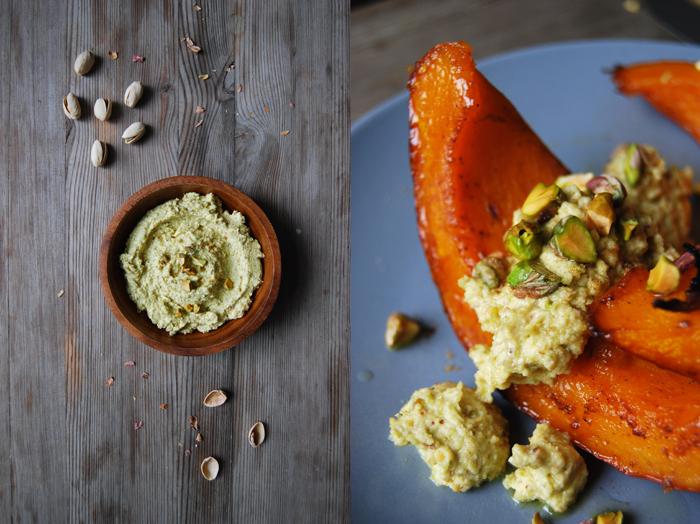 I love the idea of adding cumin and pistachios to feta – squash and feta is a favourite lunchtime side for me but this takes it to a new level.